The tag 'AIDS' is associated with 125 posts. In numerous programs, we have touched on eugenics and some of the outcomes of eugenics philosophy, including the growth of the Nazi extermination programs from the Knauer case. Some of these programs are: FTR #’s 32, 117, 124, 140, 141, 534, 664, and 908. A look at future possibilities of eugenics–something that we discuss in this program–are highlighted in FTR #909 and AFA #39. Important book on the subject include The War Against the Weak, by Edwin Black and The Nazi Connection by Stephan Kuhl. In FTR #1013, we recapped Peter Levenda’s prescient analysis of the overlap between eugenics and fascist iterations of anti-immigrant sentiment. In this broadcast, eugenics, anti-immigration sentiment, genetic engineering and the “immortality-striving” Transhumanist movement are highlighted, noting the progression from the fascism of the 1930’s to imminent steps that would augment the ascension of a truly “superhuman” elite, to the ultimately lethal detriment of the rest of society. We begin with prognostications about the future. These are auguries of a future-to-come. A look at the present suggests that these prognostications are not unrealistic. Nazis/white supremacists are already distorting genetic research to suit their own ends. Not surprisingly, academics in the field have not been enthusiastic about engaging them. In the past, genetic research has been supportive of eugenics philosophy. A 14-word posting on the Department of Homeland Security website has raised eyebrows. We believe it is an example of dog-whistling by fascist/Nazi elements inside of the DHS. The “Fourteen Words” were minted by Order member and Alan Berg murder getaway driver David Lane. “88” is a well-known clandestine Nazi salute. In the immediate aftermath of World War II, using the Nazi salute “Heil Hitler” was banned. To circumvent that, Nazis said “88,” because H is the eighth letter in the alphabet. The numbers 14 and 88 are often combined by Nazis. It comes as no surprise that Ian M. Smith–a former DHS Trump appointee–had documented links with white supremacists. This program supplements and recapitulates both FTR #912 and AFA #39. In turn, several other, overlapping programs should be examined to flesh out one’s understanding of the phenomena discussed here, including: FTR #’s 606, 682 and 686, as well as AFA #16. Central to our analysis is a look at an excerpt from testimony before a House appropriations subcommittee that was drawing up the defense budget for the following year. (The hearings were in 1969.) The testimony discusses the possibility of using genetic engineering to produce a disease that would be “refractory” to the immune system. This is virtually the clinical definition of AIDS. It is worth noting that the project was funded, and just such a disease—AIDS—appeared in just the time frame posited. It is also worth noting that, in the 2002 edition of A Higher Form of Killing, this passage is omitted!!
. . . As long ago as 1962, forty scientists were employed at the U.S. Army biological warfare laboratories on full-time genetics research. ‘Many others,’ it was said, ‘appreciate the implications of genetics for their own work.’ The implications were made more specific that genetic engineering could solve one of the major disadvantages of biological warfare, that it is limited to diseases which occur naturally somewhere in the world. ‘Within the next 5 to 10 years, it would probably be possible to make a new infective micro-organism which could differ in certain important respects from any known disease-causing organisms. Most important of these is that it might be refractory to the immunological and therapeutic processes upon which we depend to maintain our relative freedom from infectious disease.’ The possibility that such a ‘super germ’ may have been successfully produced in a laboratory somewhere in the world in the years since that assessment was made is one which should not be too readily cast aside. . .
Purebred Northern Europeans possess a hereditary immunity to infection by HIV, a gene (CCR5Delta 32) that conferred immunity to the Black Death, long believed to have been bubonic plague. Bubonic plague was a major focal point of Third Reich biological weapons research, stemming from SS chief Heinrich Himmler’s interest in that disease. Disguised as a cancer research program, Nazi Germany’s plague research was presided over by Kurt Blome, the deputy surgeon general of the Third Reich. Blome went to work for the U.S. under Project Paperclip (also known as Operation Paperclip.) We wonder if the Nazi research into bubonic plague and the emergence of an immune-destroying disease to which only pure-bred Northern Europeans–“Aryans”–were immune might have been the outgrowth of Nazi-inspired U.S. biological weapons research stemming from Paperclip? In both FTR #912 and AFA #39, we highlighted Bayer’s projected purchase of Monsanto. We engage in a line of inquiry that is speculative in nature, evaluating the possibility that companies descended from the I.G. Farben German chemical cartel may absorb Monsanto, the firm noted for its development of genetically modified organisms. Specifically, Bayer and BASF figured in the reported maneuvering for Monsanto. The deal has passed American anti-trust regulators, with BASF purchasing some $9 billion in former Bayer assets to permit the deal to go forward. Against the background of the remarkable Bormann capital network’s effective control of the firms that descended from I.G. Farben, we ruminate about the possibility of genetically engineered binary pathogens being included in the food supply available to much of the world’s population. Available information highlights possible Underground Reich maneuvering to gain control of firms marketing foodstuffs to middle, lower middle and working class people. This speculation, in turn, is set against the background of information strongly suggesting that AIDS was deliberately developed. In the context of the purchase of food-producing companies, we note J.A.B Holdings and it’s associated Reimann family. They are owned by a secretive group of German billionaires, mostly related to each other. This group owns (outright or majority) a rather shocking number of major American brands, including Peets Coffee, Panera Bread, Jimmy Choo Shoes, Dougwe Eberts Coffee, and Krispy Kreme Donuts! They appear to be making a major move to dominate the U.S., and perhaps global, coffee industry. 3G owns Inbev (dominant player in the world’s liquor industry), Heinz, Kraft, and Burger King, who they quickly moved to Canada and merged with Tim Hortons, a massive Canadian restaurant chain, for tax breaks. They also own the largest logistics/railroad company in South America and its largest retail shopping company. So, between their interests in JAB and 3G, this one family has their tentacles into a ridiculous amount of commerce. Like many German corporate citizens, they make their headquarters in Luxembourg. 1.–JAB Holding’s apparent move to dominate the coffee market. 2.–Review of the career of Franz Liesau Zacharias. 3.–As discussed in AFA #39, the Nazis began research­ing toxic agents on apes and then moved on to humans—inmates in con­cen­tra­tion camps. AIDS results from a mon­key virus that even­tu­ally jumped to humans as well. Does the pro­gres­sion in the Nazi death camps of test­ing on apes to test­ing on humans have any rela­tion­ship with the pro­gres­sion of a simian virus to infec­tion of humans? Might the cre­ation of AIDS have stemmed from Nazi research? Is it an acci­dent that the hered­i­tary immu­nity from HIV infec­tion is only present in the white race, and [accord­ing to some sources] North­ern Euro­peans in par­tic­u­lar? Is it an acci­dent that peo­ple of African extrac­tion are par­tic­u­larly sus­cep­ti­ble to HIV infec­tion? 4.–Dr. Franz Liesau Zaccharias was the Abwehr agent who obtained the apes for the Nazi medical experiments. He was badly wanted by Western intelligence after the war. Why?! Western intelligence agencies certainly didn’t need anyone to teach them how to obtain apes from Africa. Experimenting on animals is not a war crime. The suspicion here is that he had discovered something of value during his primate work. Evidence also suggests that he remained part of The Underground Reich. 5.–Among the dis­eases that Liesau Zacharias’ ani­mals were used for test­ing was “the plague”! Did the Nazis note that some peo­ple appeared to be immune to infec­tion with plague? Were tis­sue and/or sera sam­ples taken and pre­served for fur­ther study? Was this in any way con­nected to the even­tual evo­lu­tion of the CCR5-delta 32 gene as a hered­i­tary pro­tec­tion against infec­tion by HIV? Is it pos­si­ble that Liesau Zacharias was actu­ally tar­geted for recruit­ment by the U.S. for Project Paper­clip? Did Liesau Zacharias expe­ri­ence an out­break of immun­od­e­fi­ciency among his pri­mates await­ing ship­ment to Ger­many? Might such an out­break have been due to SIV? Did Liesau Zacharias take tis­sue and sera sam­ples from infected pri­mates? Might such a devel­op­ment have been related to his impor­tance to the Allies? In AFA #39, we returned to the issue of AIDS as a genetically-engineered, binary biological weapon. In that context, we highlighted Bayer’s purchase of Monsanto. ” . . . . Ken Alibek, who played an important role in the Soviet Union’s bio-weaponry program before emigrating to the US, says he encountered ‘an alarming level of ignorance’ about biological weapons within the expert community of his adopted country. He reports: ‘Some of the best scientists I’ve met in the West say it isn’t possible to alter viruses genetically to make reliable weapons. . . . My knowledge and experience tell me that they are wrong.’ . . . .” All of the contents of this website as of 12/19/2014–Dave Emory’s 37+ years of research and broadcasting–as well as hours of videotaped lectures are available on a 32GB flash drive. Dave offers his programs and articles for free–your support is very much appreciated. All of the contents of this website as of 12/19/2014–Dave Emory’s 37+ years of research and broadcasting–as well as hours of videotaped lectures are available on a 32GB flash drive. Dave offers his programs and articles for free–your support is very much appreciated. This broadcast is intended to be used in conjunction with L-1 and L-2: Might the future see Bormann network-controlled pharmaceuticals and/or foodstuffs used to disseminate “Aryan-friendly,” genetically-engineered binary pathogens to an already vulnerable and depleted humanity? Might we see “Aryan” space aliens (“The Nine” or some manifestation of same) come down to earth to rule, disseminating some kind of “divine” or “extraterrestrial” eugenics doctrine? Might this be combined with a variety of theocratic Aryan supremacy religion? With the Reinhard Gehlen spy outfit and the Project [Operation] Paperclip scientists having been incorporated into the very heart of the U.S. and Western national security establishments and with the Bormann capital network dominating the international cartel system that stands astride the international capital markets, what we have termed the Underground Reich did indeed prevail in the postwar period. In this program, we take a look at what a Nazi future might look like. Examining some of the paths of apparent evolution from Project Paperclip, we highlight the probable development of AIDS as a biological weapon and underscore the Nazi racist/eugenics overtones of various New Age philosophies.
. . . As long ago as 1962, forty scientists were employed at the U.S. Army biological warfare laboratories on full-time genetics research. ‘Many others,’ it was said, ‘appreciate the implications of genetics for their own work.’ The implications were made more specific that genetic engineering could solve one of the major disadvantages of biological warfare, that it is limited to diseases which occur naturally somewhere in the world. ‘Within the next 5 to 10 years, it would probably be possible to make a new infective micro-organism which could differ in certain important respects from any known disease-causing organisms. Most important of these is that it might be refractory to the immunological and therapeutic processes upon which we depend to maintain our relative freedom from infectious disease.’ [Italics are Mr. Emory’s.] The possibility that such a ‘super germ’ may have been successfully produced in a laboratory somewhere in the world in the years since that assessment was made is one which should not be too readily cast aside. . .
Just as “Aryans” possess a hereditary immunity to HIV infection, people of African descent have a hereditary susceptibility to HIV infection. Just as Project Paperclip figures into analysis of the development of AIDS, development of aspects of the so-called New Age also track back to the importation of Nazi military scientists. Of particular interest in that regard are racist/eugenicist New Age philosophies that attribute the origins of humanity to “space aliens” with “Aryan” features–blonde hair, blue eyes and fair skin. Foremost among those New Age cults is “The Nine”–overlapping a surprisingly large aspect of the New Age. Purporting to be, variously, the progenitors of the human race (from outer space, of course) and the gods of Egypt, “The Nine” feature the blonde hair, blue eyes, etc. that are common to many of the “ET” origins of humanity. Another key element of discussion and analysis is the Bormann group’s use of the former member companies of I.G. Farben. Bayer has bought Monsanto (the largest and best-known of the “GM” companies.) Although anti-trust rules may force the spin-off of some of the parts of Monsanto, BASF–another of the I.G. member companies under Bormann control–is poised to snap those up. We also note that Bayer has acquired Merck’s pharmaceutical business, giving it a profound presence in the pharmaceutical and vaccine business. With AIDS having apparently signaled the successful development of a genetically-engineered binary pathogen against which pure-bred Northern Europeans harbor a genetic immunity, we wonder if we will be seeing the introduction of such pathogens into foods and/or vaccines and/or medecines? Will this, in turn, be dovetailed with the ascent of New Age religions that extoll white people/Aryans? As non-whites succumb to disease introduced through the food supply and/or medecines, will this New Age/Nazi cultism increase and achieve global dominance? Again, this program is intended to be used in conjunction with L-1 and L-2. 1.–Allied interest in Franz Liesau Zaccharias, who obtained monkeys for use in Nazi medical experiments for I.G. Farben. The fact that the Third Reich began experimenting on monkeys, and then began experimenting on humans. 2.–The fact that the etiology of AIDS mirrors the progression of Third Reich medical experiments–progressing from apes to humans. 3.–Rumination about similarities between SIV and HIV-2: according to a knowledgeable source, SIV (native to the African Green Monkey) is identical to HIV-2, except for a piece of genetic material that functions like a period in a sentence. It signals genes to stop reading one sequence of amino acids and begin reading another. The source opined that this appeared to be a gene-engineering manifestation. 4.–Speculation about the “Black Death” actually being a viral-borne, infectious hemorrhagic fever, encountered by German and Japanese armies during World War II. Was this researched by Unit 731, the Japanese biological warfare research unit whose results were incorporated into the U.S. biological warfare program after World War II? 5.–Rumination about the possibility that Zaccharias’s apes had contracted simian AIDS from SIV infection and the related hypothetical possibility that this led to the discovery of an immune-destroying infectious agent that affected apes. Might this have been why the Allies were so interested in Zaccharias? Surely, they didn’t need someone to teach them how to get apes from Africa. By the same token, experimenting on primates is not a war crime. So WHY were the Allies so interested in Zaccharias? 6.–Discussion of the Urantia text, with its New Age devotees manifesting a racist eugenics philosophy masked by an “extraterrestrial” facade. 7.–Discussion of the Hare Krishna sect, key elements of which manifest a racist philosophy that dovetails with that of the Urantia cult and The Nine. 8.–Discussion of Swiss/Brazilian billionaire Jorge Paolo Lemann, a possible Bormann operative whose enterprises are buying up many food companies that cater to lower middle and working class people. 8.–Becker GMBH’s genesis with the SS and capital stolen from Jews during the Holocaust. 9.–Becker GMBH’s absorption into ConAgra foods, a major manufacturer of foodstuffs for lower-middle and working-class people. Apparently the application of genetic engineering to the discipline of biological warfare, AIDS manifests a highly suspicious epidemiological pattern. Only pure bred Northern Europeans–“Aryans”–featuring the CCR5 delta 32 gene have a hereditary immunity to infection by HIV. People of African extraction have a hereditary susceptibility to HIV infection. Such an eventuality was directly foreshadowed in a House Appropriations Subcommittee hearing for the Pentagon budget: “Within the next 5 to 10 years, it would probably be possible to make a new infective micro-organism which could differ in certain important respects from any known disease-causing organisms. Most important of these is that it might be refractory to the immunological and therapeutic processes upon which we depend to maintain our relative freedom from infectious disease.” That is VERY close to being the clinical definition of AIDS. Much of the program underscores the inextricable link between the remarkable and deadly Bormann capital network and I.G. Farben, during and after World War II. (We note that both Bayer and BASF are some of the I.G.’s successor companies, maintaining their profound connection to the Bormann group and the Underground Reich.) In addition to the prospect of the successor companies to I.G. Farben controlling the manufacture and application of GMO’s, we highlight disturbing evidence that other companies and interests that may well be part of the Bormann/Underground Reich nexus are gaining significant market shares of foodstuffs manufacturers that cater to middle, lower-middle and working-class populations. 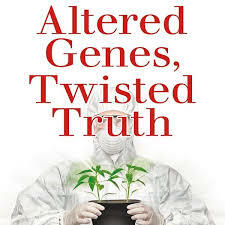 Will genetically-engineered binary pathogens be introduced into the food supply? Will we be seeing the realization of Hitler’s vision of an “Aryan world” through dietary/culinary genocide? Program Highlights Include: BASF’s partnership with Monsanto in the latter’s GMO projects; forecasts that BASF may acquire parts of Monsanto and/or Bayer that must be spun-off due to anti-trust considerations; Becker GMBH (a German food company begun by an SS officer with funds purloined during the Holocaust); Becker GMBH’s incorporation into ConAgra foods (almost certainly in exchange for significant stock ownership and/or a place on the board of directors); Brazilian-born, Swiss-based Jorge Paolo Lemann’s purchase of H.J. Heinz, Burger King and Anheuser-Busch; the development of the CCR5, delta 32 gene for successful stem-cell therapy for AIDS sufferers. Although we have no hard information of a possible biological warfare link to the outbreak, an article from former Naval Intelligence officer Wayne Madsen is worth considering in that regard. In 2009, Germany was pondering the shipment of deadly pathogens, including Ebola virus to Ft. Detrick in Maryland. They voiced concern about the possibility that the samples might be weaponized, possibly giving themselves plausible deniability in the event that they were used for biological war purposes. All of the contents of this website as of 10/2/2014–Dave Emory’s 35+ years of research and broadcasting–as well as hours of videotaped lectures are available on a 32GB flash drive. Revisiting the heroic Ed Haslam, we highlight new points of information from his book “Dr. Mary’s Monkey,” as well as setting forth information about Ebola, indicating that the official version of the evolution of that deadly disease is badly skewed. Key points of information in Ed’s new edition include the J. Edgar Hoover’s order to preclude FBI involvement in the investigation of Dr. Mary Sherman’s murder; Meyer Lansky aide Chauncey Holt’s links to Lee Harvey Oswald, the CIA and Operation Mongoose (the Agency’s anti-Castro effort); Stanley Stumpf’s possible role in moving Dr. Mary Sherman’s body; the Warren Commission’s omission of Oswald’s signed time cards from the Reilly Coffee Company; Victoria and Owen Hawes’ account of Oswald’s visits to a neighbor of Dr. Mary Sherman and the possible disposal of bio-waste in the neighbor’s toilet; crime scene photos of Dr. Mary Sherman’d corpse that disprove the official version of her killing; the CIA’s complete redaction of “Crown Jewel #1”–the Agency’s activities between the late 1950’s and 1964. In previous posts, we have noted that Al Jazeera is run by the Muslim Brotherhood. We have also dealt with the Nazi tract “Serpent’s Walk,” which focuses on a Nazi takeover of the U.S. in the mid-21st century. Fundamental to the scenario presented in the book is the Underground Reich/SS money component buying into the opinion-forming media, in order to swing the American people’s point of view in a pro-Nazi direction. With Al Jazeera among those media outlets gaining gravitas in the U.S., it is worth examining the network in detail to understand its relationship with the Brotherhood, an Islamic fascist organization. The Al Jazeera network’s shepherding of a report about the late Yasser Arafat having been poisoned with polonium 210 affords us an ideal opportunity to evaluate the outlet’s journalistic integrity. (Polonium 210 is a highly radioactive substance.) The “investigation” is an Al Jazeera “op” from start to finish, overseen by a former U.S. State Department security officer. The alleged “poisoning” is: extraordinarily unlikely; at variance with the conclusions of the French medical team attending Arafat and in conflict with the conclusions of the PLO leader’s personal physician, who attributed the death to AIDS. Spitfire List is licensed under Creative Commons.